Air New Zealand will be flying non-stop between Auckland and Taipei from 1 November 2018. The flight will take around 11 hours and will depart year-round three times a week. As well as Economy (with optional Skycouch™) and Premium Economy seats, you have the option of Business Premier™. 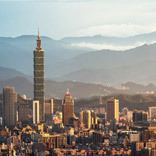 Whether you are heading home and looking for your next Asia holiday destination, Taipei offers urban sophistication, cultural attractions and breathtaking natural scenery. With its unique blend of Asian ethnicities, Taipei is both beautiful and fascinating. At Air New Zealand we take pride in our crew members who provide a warm and safe experience for all customers. We also have some Chinese speaking crew members on-board our non-stop flights to Taipei. Take more with you, or bring more back. Enjoy 2x23kg checked baggage on Economy and Premium Economy fares. If you want to take more, you can purchase a Prepaid Extra Bag as part of your booking or any time before your day of travel. The maximum number is three bags per person, including any Prepaid Extra Bags or frequent flyer membership extras1. Whether you're a couple who'd like a bit of extra room, a parent with a young child or a parent with two restless kids, you’ll find our innovative Economy Skycouch™ is the ideal solution. The Economy Skycouch™ is a row of Economy seats that can be turned into a couch after takeoff, so you and your friend or family member can stretch out. It can be used as seating, a couch or even a play area and you will get some lovely bedding and pillows. If travelling with an infant, you can use the Skycouch Infant Harness and Belt which allows infants to remain lying down throughout the cruise phase of flight, even when the seatbelt sign is on. 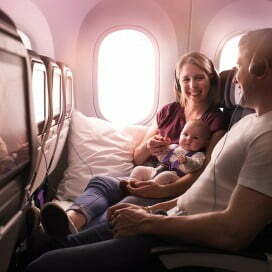 The Skycouch Infant Harness, Belt and Pod will be available on all Air New Zealand Boeing 777 and 787-9 operated long-haul services from mid-2018 and will be provided to all Economy Skycouch customers travelling with infants by cabin crew. Because relaxing over a good meal is one of life's great pleasures, we've consulted with top food and wine experts to design our menus to reflect the fresh, innovative cuisine of New Zealand.